Click on the permies link for more info. stand it up[ on end and, using a chainsaw, slice around the side all round to produce a log of even diameter and roundness from top to bottom. Put the top section to one side. Cut out a circular hole in each of the other segments all the same sized hole. Leaving a wall in each segment of two to four inches. Drill a hole in the side of each of the segments. Put a bung side hole of each segment bar one of them, which will be used as the bottom one. Take the bottom segment, with the hole in the side, put another segment on top of it. On this top segment, splice in some top bars. Then cap the top segment with the segment that did not have the centre cut out. This forms the cap. Mount the stack on some bricks or breeze blocks. The hive can be increased by adding the other segments on the bottom as the bees build downwards. As this happens, the stack that was on the bottom, but is now one segment up, can have its access hole bunged up, leaving the hole in the newly added segment at the bottom in its place. My first thought is - when did you last try to lift anything that heavy? Even lifting one of those sections with bees and stores would be hernia-inducing. Forget nadiring: where log hives are still used, such as SW France, they cut chunks of honey out from the top, while the combs are supported by crossed spiles. You could use a light super or inverted glass jar instead, but not a section of tree! A few too many beers inside me when I posted that last night Phil. Actually Phil, could you outline the main difference, in terms function, between nadiring and supering? With a vertical hive, you can increase volume by adding space above (supering) or below (nadiring). Conventionally, supers are added when the hive is crowded and ready to store honey in earnest, which they always do above their brood, to make use of the warm air rising to evaporate water from their nectar. Multiple supers can be added in a productive season, with various systems on offer for shuffling the filled and empty boxes for maximum yield. Nadiring is used mostly in the Warré system, which uses a single box size for both brood and honey, to allow downward expansion of the brood nest, which in turns gives bees the opportunity to back-fill the space that becomes vacant above them as adult bees emerge from their cells. Because nadiring requires all the boxes in a hive to be lifted simultaneously - in order to maintain nest atmosphere - some form of mechanical lift is generally used for the purpose, to avoid hernias and slipped discs. To avoid excessive lifting, most Warré beekeepers will nadir in spring with the number of boxes they expect to be filled by the end of the season. 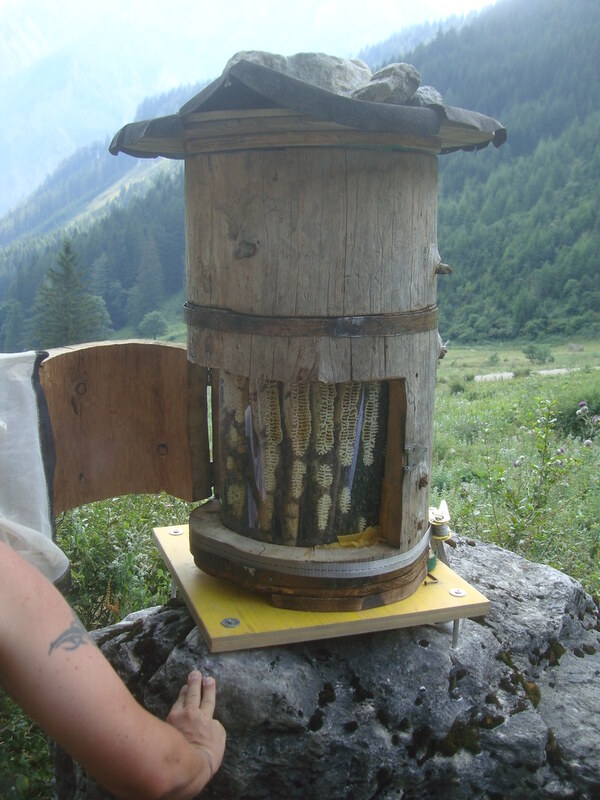 Some Warré beekeepers use a combination of nadiring and supering: nadiring in spring for downward expansion, while supering at the beginning of a flow to maximize honey crops. That was extremely clear. Thank you. On balance, I think I will stick with nadiring as this seems to me that I am not forcing back filling on the bees for my own benefit. Instead, they will back fill as they free up comb from brood hatching out below. In other words, they will back fill to the extent that they see fit and not to the extent that I see fit. I have no particular empirical evidence to back the above up. It just seems instinctively right. Or, is that all baloney phil and the bees don't actually care? Posted: Tue Feb 18, 2014 5:00 pm Post subject: Thank you for the post! Very cool...Ive heard about Sepp Holzer before & this is just icing on the cake. I wonder what his thoughts on Mason Bees are? I have a number of sections of Leyland Cyprus about 90cm across. I could make one with a little careful use of my chainsaw. However, I am not sure the bees would take to a tree with quite such a high resin content. Would I have to wait a year or more for the more volatile compounds to evaporate before they would move in? I have no idea about the toxicity or otherwise to bees of Leyland Cypress (and given it's origin as a hybrid in a Welsh forest, maybe no one does) but it became clear to me that the the toxicity of tree sap is not straightforward when I read a thread about the subject on the Yahoo Warré forum. Search for redcedar (one word) to find the posts by Alex Templeton if you are interested. Thanks Gareth, I was thinking in terms of the bees not wanting to stay there because of the smell rather than toxicity which I hadn't thought of. If they wouldn't move in though I guess that may well because they perceive it to be toxic. I don't know about the toxicity in the wood. But, when it is burned leylandi smoke gives you a right belly ache. When I was younger I used to work in the woods and was told to always stand upwind of burning leylandi brash. One time I forgot. I didn't forget a second time. Have been told that the smoke is carcinogenic - not done any googling to check. We do burn it in our woodstove however. Somewhere on David Heaf's site I'm sure he used to say - as others have said before - that Italian bees are the best for Warré hives, due to their enthusiastic comb-building and general prolificity - but I can't find the reference now. That makes sense though, given the difficulties some UK people have had getting the bees to move downwards. There has been much discussion recently on the Warré forum about the bees getting stuck and not moving down. If one can see a common thread, it appears -as Phil says- to be honey flow (or absence thereof). Some are of the opinion that the type of bee plays a role, but I do not find problems with my local mongrels in Warrés in central southern England. I certainly would not contemplate using Italians in my locality, for all sorts of reason including the fact that they are not native. For those who live where no honey bees are native, the considerations may be different. Supering after the bees have extended the brood nest to its maximum is certainly a possibility and can give some beautiful clean cut comb. We do burn it in our woodstove however. I try but find it poor in comparison with sycamore or ash wood. Those would be my preference too Gareth but I wasn't going to turn down three cubic metres plus free!